You’ll find Fussie Cat's meat first, low carbohydrate philosophy in every recipe. The result is Physiologically Tuned™ nutrition for your pet that’s rich in complete animal proteins, and loaded with flavor. 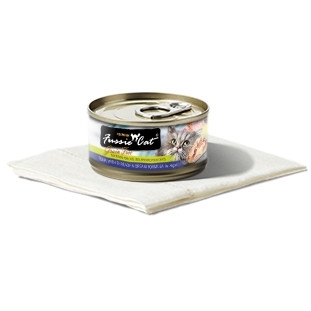 Fussie Cat uses quality meats such as boneless chicken, duck, tuna, shrimp, and prawns, then further supplement Fussie Cat recipes with vital nutrients, including a complete spectrum of vitamins and minerals. *Visit Hanoverdale Agway for a large variety of Fussie Cat Canned Cat Food for finicky cats.